The Great Sphinx with Khephren's Pyramid in the background. 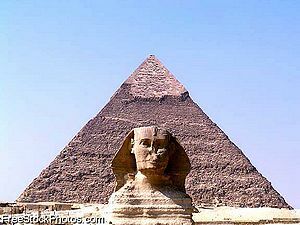 The Great Sphinx is an ancient Egyptian monument believed to have been built in about 2500 BC, around the same time as the pyramids; it is part of the complex of structures related to Khephren's second pyramid at Giza. The Sphinx is a statue that consists of a figure of a lion's body surmounted with a human head. The current state of the sphinx is showing its age. Thousands of years have made the statue weather worn, and the nose is now mostly broken off. The climate of the region, however, has kept the statue in remarkable shape despite its antiquity. This page was last modified on 11 July 2016, at 00:56.